How do you express the movement of the ball in the above animation using words and a gesture? Kita(2009) a leading researcher in gesture, found that language influences the way we gesture. Japanese, lacking a verb for swing were more likely to move their fingers down to the right in a straight line (below top) whereas English speakers, who do have a verb to swing, were more likely to use an arc (below, bottom). 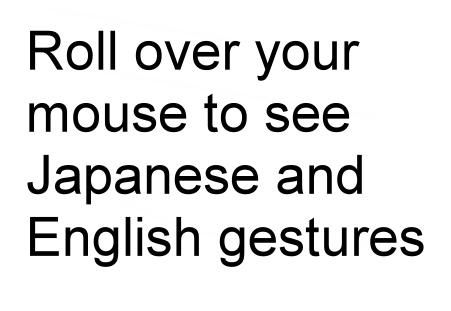 Japanese speakers, lacking a compound verb "roll down" are more likely to say "while rolling goes down" (korogarinagara ochiru　転がながら落ちる) and when gesturing likewise, more likely to making a rotating movement first (korogari), followed by a downward movement (ochiru) of their finger afterwards (image below top) than Britons who were more likely to move their finger in a rotating movement while moving their finger downwards (gesture below bottom). 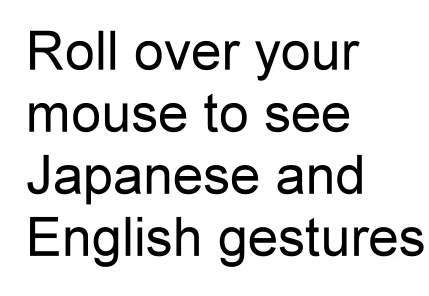 It is important that the Japanese speaker is speaking Japanese at the time of making the gesture otherwise the above effect will not be seen. Please see Professor Kita's research.